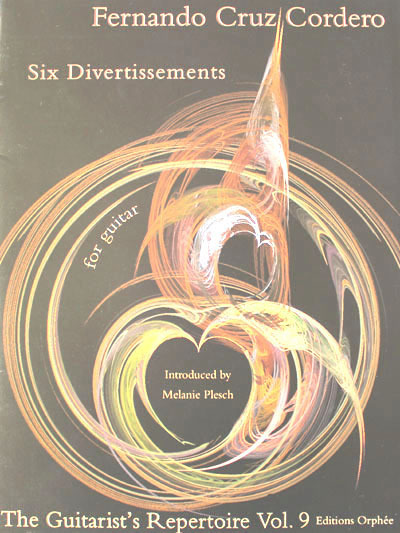 Cordero’s Six Divertissements pour la guitare were published in Paris at an unspecified date by the imprimeur L. Parent. The name A. Lafont mentioned in the title page is not that of the publisher, as was once believed, but possibly that of the designer/engraver of the cover. The imprint at the foot of the last page, on the other hand, reads “Paris. L. Parent Grav: Imp: 55 rue Rochechuart.” Cordero, as mentioned before, visited Paris on at least two occasions: between October 1851 and March 1852, and in 1861. It is likely that the Six Divertissements had been composed and published during, or as a result of, his first trip. It is worth noting the dedication to Ciebra on the first of the Six Divertissements, bearing in mind that Ciebra had dedicated one of his compositions to Cordero in 1851. Cordero’s Six Divertissements are an interesting example of the reception of Romanticism by guitar composers towards the mid-nineteenth century. They illustrate the period of transition between the Classical (notably that of Sor and Aguado) and Romantic styles in the guitar repertoire. Three of them bear descriptive or character titles: “Le Depart” (no. 1), “Le Lunatique” (no. 4), and “La Reminiscence” (no. 6), while the remaining three are simply identified by their numbers. The latter are comparatively more traditional and conservative and can easily be related to the work of Sor and Aguado. The re-edition of these works, more than a hundred and fifty years since their original publication, is a valuable contribution towards the recuperation of the guitar literature of the mid-nineteenth century.